It’s supposed to feel like over 100 degrees (37.7 C) today and I’m working on my trenchcoat. Although, now that it’s no longer double breasted, can it still be called a trench? Yeah. That’s right. No longer double breasted. Somewhere in the process it went from double to single breasted. How? I don’t even know. I’d explain, but my mistake is stupid (bad measuring) yet complicated (adjusting facing widths) and without photos (too tired) will do no good. So, let’s just go with, ‘it’s a single breasted trench’. I had to take two inches of width from the front facing. I’m fairly peeved as a double breasted rain coat is specifically what I wanted. And there is zero extra red to make adjustments with. I’m just so disappointed. As I get closer to the end I’m hoping I can fudge it and make a double breasted look work. And, I decided not to do the zip out lining and save the lining material for a double breasted trench. I’m moving at a glacial pace aren’t I? So, what I have I done since we last spoke of this? I’ve added pocket bags from pocketing. I just didn’t have enough fashion fabric to make the pockets. I’ve done gobs of top stitching and sewed in my sleeve linings. I’ve also got shoulder pads pinned in place. I made the belt and cuff belts too. I upped the ante and made double belts for the cuff. What’s next? Buttonholes and hemming actually and I’ll be done. But, it’s so hot! And I missed our rainy season. So, this will sit for a bit while I work on some other bits and pieces. cute trench. love the color. Color of trench is lovely. Single, double, YOU are in charge. 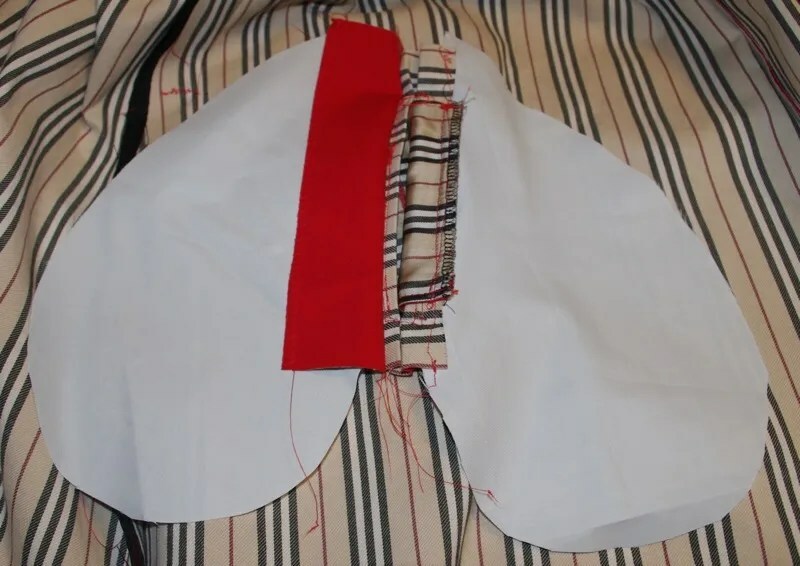 I hear you…I am also finishing up a “spring” jacket and moving at a glacial pace due to the decidedly non-jacket friendly heat and humidity. When will I accept that a jacket takes me 3 months to sew and start planning accordingly? Never, probably. Anyway I love the color and lining of yours. I am loving this trench already , your topstitching looks great . I love the Burberry accents . Your rain coat looks fantastic! Who cares if it is double breasted or single breasted when it is raining outside and you are wearing such a great coat! And, the lining is super. 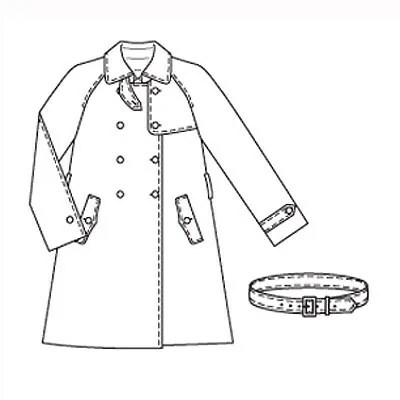 My rain coat project is still folded up in my stash – maybe next year . . . 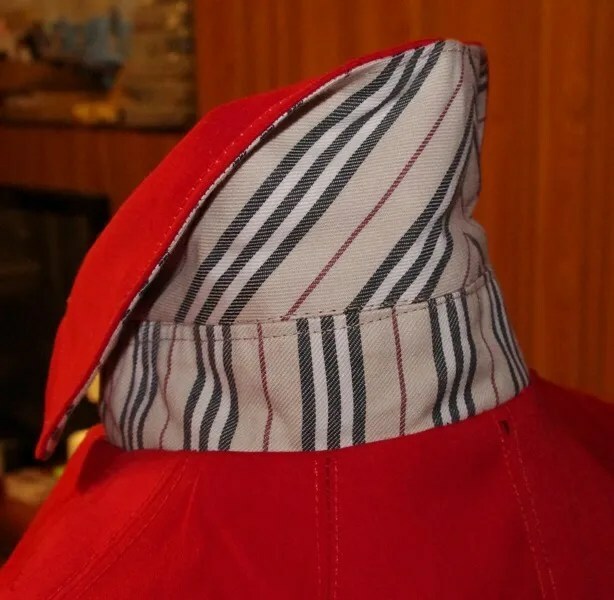 Anyway, don’t be too hard on yourself – remember there are NO mistakes in sewing, just opportunities for design enchancements! Double- or single-breasted, it’s just beautiful! Your workmanshhip & attention to detail are really impressive. You sound despondent, but it looks fabulous! It looks wonderful! If you run a single row of buttons down the front edge, won’t you get the impression of a double-breasted trench, even though you don’t have room to do the full treatment? Too bad it’s hot and miserable today, but what a head start you have on fall! It is beautiful. I really like the double belts at the cuff. Great coat. It looks amazing. Nice work! The coat is looking great despite it not being what you had envisioned. Great idea for double belts at the cuffs. You are moving at a good pace as far as I’m concerned. I’m still on the pattern stage and haven’t touched mine in ages. I got lost in not being able to decide on length and wearing ease. Maybe your post will inspire me to get back at it. It may not be what you originally envisaged, but it’s still going to look fabulous – who doesn’t need a red trench on a gloomy day?! I understand being annoyed but when the fall comes and you can wear your lovely red trench coat, the disappointment will fall away! I’m glad to see you making progress on the trench. It’s a gorgeous coat, no matter how many breasts you have! You will look stunning in this. It looks great. I saw a gorgeous single breasted trench in a Tod’s ad last year, so absolutely. My next major project has got to be using my Burberry yardage. I wish I’d bought the red. Sigh. I look forward to seeing it on you. Single or double breasted it looks great. Don’t you know that changing a jacket from double to single breasted is the ‘cheat’s FBA’! It still looks fabulous. You’ll look hot in this red hot number! Never thought of any trench coat unless it was standard double. DUH this one looks great, so much more slimming. Hope you come to love it, the work looks supurb. Well it looks pretty cute !! Hopefully you can “fix” or just get over your dissapointment and enjoy wearing it. 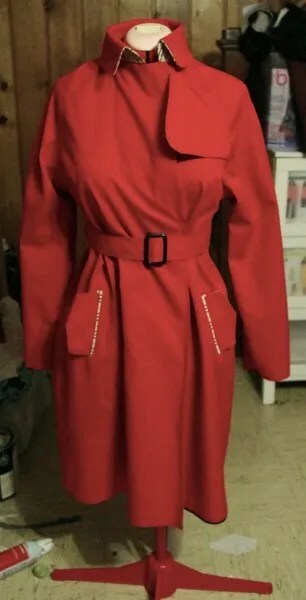 It looks great, don’t worry that it wasn’t what you originally planned – who says a trench coat can’t be single breasted, maybe you will start a new trend! It still looks extremely smart. Would a double column of buttons that ‘implied’ double-breasting be of any help? I’m sure this is in part how new fashion trends are set, when things don’t quite go to plan. I’m so sorry it’s not turning out the way you intended. It does look great the way it is, though. I’ll think cool thoughts in your direction if you’ll do the same for me. I’m just up the road in PA. I hope you can make it work because it is looking GORGEOUS! Oh, so sorry that your “design decision” (there are no mistakes!) has dispirited you. It is hard to make yourself finish a project when you are disappointed. Put it aside until July. Then go back and decide if you can bear to sew it to completion. You have worked so hard on it already that it would be a shame to abandon it forever. Plus, now you have an excuse to make another trench.